RHP Dillon Gee has been hospitalized with numbness in the fingers of his throwing hand, according to Adam Rubin and multiple sources in the Mets organization. Manager Terry Collins said Gee is due to undergo an angiogram. “They aren’t sure what it is yet,” Collins said. Bobby Parnell had a similar malady early last year, and had to spend time on the DL. This type of issue is usually related to a circulatory problem. Gee was scheduled to pitch the first game after the All-Star Break in place of Johan Santana, who is already nursing a bum ankle that was hit by a batted ball he hurt covering first. With Gee potentially on track to miss that start, and Santana already hurt, the stalwart Mets rotation suddenly seems a little unstable. It’s too early to tell what impact this episode is going to have on Gee’s spot in the rotation, but the Mets may need some reinforcements sooner than later. It may be time for another spot start by Miguel Batista. Or it may be time for the dawn of the Matt Harvey Era. Harvey has pitched well for the Buffalo Bisons, and is chomping at the bit to prove himself in the majors. Harvey is 7-4 with a 3.39 ERA, .234 BA against, and 102 Ks in 98.1 innings. 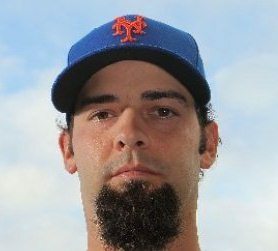 The Mets may balk at bringing him up after only 98 innings at Triple-A. The Alderson regime has been cautious with its most prized prospects, which is the right approach. The Mets are playing competitive baseball in 2012, but the focus of this team is on 2013 and 2014, as it has been since the offseason. But it all depends on Gee’s status coming out of the All-Star break. Update (12:05PM): According to Mike Kerwick, Gee will not make his next start. Chris Schwinden, anyone? Update (12:18PM): According to Adam Rubin, Doctors found a clot in an artery in his right shoulder. Sounds like it could have been a lot worse than just numbness in his fingers. Doctors cleared the clot with a catheter. Fortunately, Dillon’s OK.
Back Have the Mets Peaked? Next Should the Mets Deal Before the Deadline? I remember Glavine having a similar problem as well back in ’06. Santana’s ankle wasn’t hurt from a batted ball. He was covering first on a grounder Turner got to. When Turner made the throw, (which could have been better), Johan fumbled it a bit running to the bag. When he got there, the batter stepped on his ankle, which turned over a little. At least that’s the way I remember it from the replay. If Gee has to go on the DL for an extended period, I don’t want to see Batista or Hefner inserted into the rotation. Spot start, fine. But longer than that? Might indeed be time for Harvey. Makes you wonder whether or not this is a lingering issue for Gee, stemming from the torn labrum he suffered in 2009. Has me asking what issues may have arisen over the past 3 years, especially since the Mets were the ones who advised against him having the surgery – when he was on-record in stating he would’ve had it. “Pitching for Ponce, which was managed by Eduardo Perez, Gee ended up being the league’s pitcher of the year. But he had pitched that winter-league season with a partially torn labrum — an injury he suffered working out with a personal trainer between the regular season and winter-league assignment. Gee figured he would need shoulder surgery, but Mets doctors said the percentage tear was small enough that he could avoid it. He was limited to nine games in 2009, and continues to pitch with the tear. Hefner played good enough to be the #5 starter again unless something happened to him while they for some reason made him a seat warmer. I dunno what causes blood clots, but I’ve never heard it related to soft tissue tears, Walnutz. I also don’t know what is done about blood clots. I thought it was “break up the clot” followed by “nothing”. But apparently not, as the Mets have placed Gee on the DL after doctors broke up the clot. Does anyone else know what happens now? As for Harvey, he’s walking 4 guys per 9 in AAA. He’s not ready. Sure, he can throw 94 — so can Batista. For spot starter, I’d like Batista against an aggressive team or Hefner against a patient one. For longer term, I dunno, I’d alternate those guys based on match-ups, or check in on Randy Wolf. He’s been bad, but also unlucky, and he’s healthy, and has always rebounded in the past, and will benefit from a slightly bigger park. Over an extended period, I’m guessing he’s a better bet than Bautista or Hefner, and his current stats are so bad I bet he’d come cheap.